Videos: Watch lava fountaining at Mayon Volcano on Jan. 22 and 23, 2018 - Balita Boss! Mount Mayon, the Philippines’ most active volcano spewed fountains of lava and massive ash plumes on Monday night and Tuesday morning (January 22 and 23, 2018). 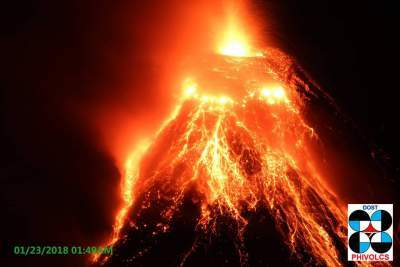 According to Philippine Institute of Volcanology and Seismology (PHIVOLCS), lava fountaining at Mayon Volcano reached a height of 500 to 700 meters, and produced a 4-kilometer high ash plume. Watch below the lava fountaining at Mayon Volcano.